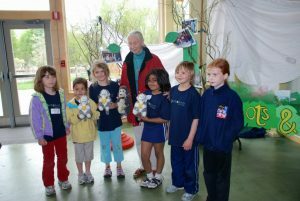 It was such an honor to meet Dr. Jane Goodall with the Bishop Green Bees and Ottoson Middle School Roots & Shoots groups, 10 years ago. Her work was a major inspiration for author Sheryl Davis, in creating the character of Daniel for her children’s series. We continue to draw inspiration from her work and were honored to publish a foreword from Manoj Gautam, director of the Jane Goodall Institute of Nepal, in our newly expanded edition of The Mystical Magical Abracadabracal Daniel McDougal McDouglas McFly! 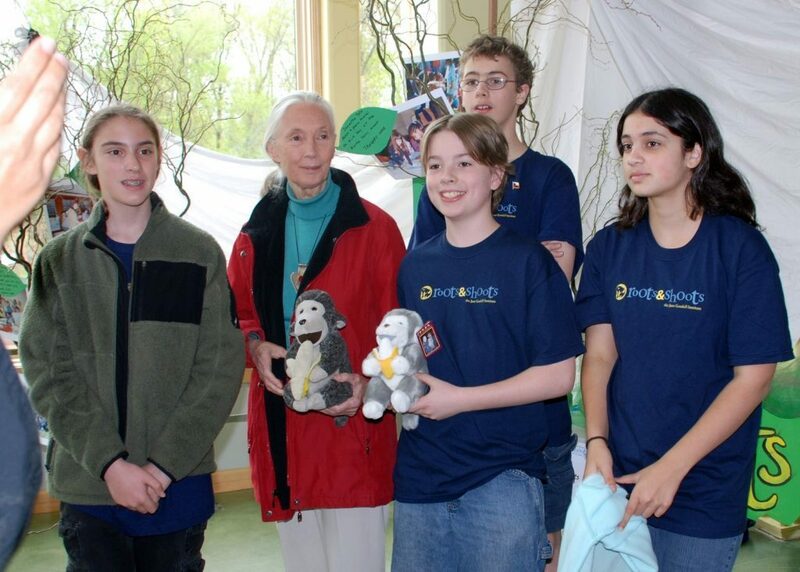 PHOTOS: Dr. Jane Goodall posed with members of the Ottoson Middle School (left) and Bishop Elementary “Green Bees” Roots & Shoots groups during her visit to Boston in 2008. The rising generation of young people is primed to develop compassion and respect for the health of our planet and its inhabitants. This book enters their world at this receptive stage in their development, serving as a unique resource to keep the issues of conservation and sustainability fresh and interesting so our young readers can best follow the direction in which we guide them. Capturing their imaginations with its magical theme and nature-activity guide, this book deftly leverages children’s innate interest in animals and the environment while illuminating the current plight of our planet’s natural environment and life forms. Then the book gives kids fun, practical tools to make a difference. With its beguiling story, illustrations, and rhyme, The Mystical Magical Abracadabracal Daniel McDougal McDouglas McFly gently introduces the dangers that threaten the natural world. But all is not lost! Then the main character Daniel models effective actions and language for dealing with these concerns. The book also provides engaging nature activities that empower children to make a difference and motivate others. Deftly leveraging children’s innate interest in animals and the environment, the associated website, kidinakilt.com, expands the book’s themes and characters and adds new activities, crafts, games, and contests. The slightly roguish, irresistible, and action-oriented Daniel, “your friendly neighborhood environmental superhero kid-in-a-kilt,” is a delightfully relatable character who inspires children while fully entertaining them and engaging their innate enthusiasm. This book is a product of a five-year labor of love by two of the most thoughtful and hardworking people I know — the author, Sheryl Davis and the publisher, Charlotte Pierce. I am honored and proud they have given me this opportunity to be part of its making and sharing. Having personally distributed this book at the Asia for Animals Conference 2017 in Kathmandu, Nepal and at JGI Nepal to the parents and teachers among my colleagues, I have witnessed the joy and involvement it elicits from both young and adult readers. The Mystical Magical Abracadabracal Daniel McDougal McDouglas McFly will become “one of those books” that never leave the bedside table!